Open gym is supervised by our staff and provides a safe environment for working on the skills of your choice. 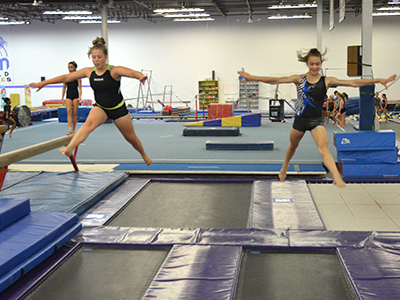 Although open gym is supervised, it is a non-instructional time for gymnasts to work on skills or just play! Members and non-members of all abilities are welcome. Open Gym is offered for children of all ages. *Please note, for liability and safety reasons parents are not allowed in the practice areas with the gymnasts. Cost per class is $10 for members and $15 for non-members. All Open Gyms are cash payment only. Please check our CALENDAR for any possible Open Gym schedulings or cancellations. If you are not a member or have not updated your waiver with us in the past year, we will need a signed waiver for participation. Click HERE for a printable waiver.